An Earthquake of 7.5 magnitude struck in Nepal and East-North of India yesterday i.e 25th of April. This earthquake lead to huge destruction in terms of human lives, properties and marketplaces in Nepal. It is reported that over 900 people lost their lives in this natural calamity and several injured. However an early alert of Earthquake can help you in saving many lives. Here is one such app which will alert you when there is a outbreak of Earthquake all around the world right on your Smartphone. The earthquake data is mostly retrieved from the US GS (United States Geological Survey) website, which also measures significant earthquakes around the world. There are quite a few apps but the app named Earthquake Alert for Android phones and Earthquake Map and Alert for i OS users are two most popular apps which already have millions of downloads on its respective stores. This can see magnitude 1.0+ from the US and magnitude 4.5+ from across the world. 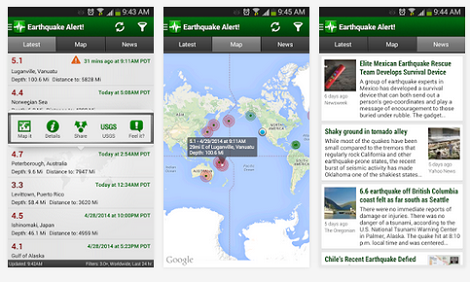 Separate tabs for map and lists last quake updates around the world. Compatible with almost all devices including budget smartphones.